Van Honsebrouck | Beer Apprentice - Craft Beer News, Reviews, Interviews and Info. For today’s craft beer review I’m going to be trying a Gueuze Fond Tradition produced by the Brouwerij Van Honsebrouck N.V. located in Ingelmunster, Belgium. I’ve only had one other brew from Van Honsebrouck and I wasn’t extremely impressed with it, however I do appreciate a nice Gueuze Lambic on occasion, so we’ll just have to see how this one is. I was having trouble getting connected to vanhonsebrouck.be, so I checked on ratebeer.com for some kind of commercial description and couldn’t find one, therefore we are just going to have to find out for ourselves what this beer is all about. This Gueuze has an ABV of 5.0% and comes in a 12.7 oz. bottle. It poured a murky brown to caramel color with an off white head of average size that was both soapy and kind of fizzy. The retention time was not so good and the lacing was a bit subpar also. As far as the aroma though… it provided a nice acidic punch. Very sour and funky. Hints of lemon citrus and green apples with a slight vinegar appeal. It was a bit musty with a nice breadiness and a yeasty component tying it all together. This was a very nice smelling beer to be honest. The taste began with a strong, lip puckering sourness. A tartness and acidity from lemon and lime citrus as well as green apples made for a consummate and pleasurable savor. It kind of tasted like sour apple jolly ranchers. The sourness came on real strong with the initial taste, but it mellowed nicely through the middle. The funk, yeast and bready ingredients really came forth at the back end and smoothed it out plus it helped develop an earthy essence. A refined vinaigrette hid underneath consolidating all of the attributes. Very nice. The mouthfeel was medium bodied. Very dry, sharp, crisp, snappy and refreshing. It had some nice, bright and lively carbonation too. It also left quite a bit of flavor behind after each sip. We have a notably good beer here. Aside from the appearance it was more than adequate in all of the other categories. It became much easier to drink as I made my way through the bottle. With each and every sip my palate adjusted and the sourness really started to subside. I could easily see myself enjoying this on a scorching hot day while sitting under a shade tree. It represents the style very well and the overall pleasure was rather good too. I would have no trouble recommending this to anyone and I’d suggest that you give the Gueuze Fond Tradition a try if you can obtain it. It’s not the best Gueuze I’ve sampled to date, but it’s still pretty darn tasty. Thanks for reading and commenting guys. It’s most appreciated. Hi guys. 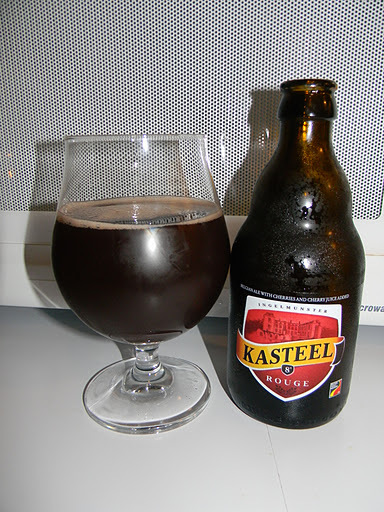 For today’s craft beer review I’m going to be trying the Kasteel Rogue by the Brouwerij Van Honsenbrouck N.V. located in Ingelmunster, Belgium. I’ve never had this beer before and I don’t really know what to expect, so let’s get to the description and find out what it’s all about. The website, vanhonsebrouck.be, provided us with this description. Castle Red is the fruit beer of the Castle range. Its unique dark red colour is obtained by mixing Castle brown that has been left to mature for at least 6 months with sour cherries. This beer has gastronomic qualities and can be drunk as an aperitif, with a BBQ, to accompany a dessert or simply as an outstanding real ale. The Kasteel Rogue comes in an 11.2 oz. bottle and it has an ABV of 8.0%. The appearance on this beer was of a very deep cherry to dark, ruby red/burgundy color. The head had, literally, a pink overcast. It was very small and very, very, very fizzy. One of the fizziest tops I have ever seen on a craft beer. It dissolved very quickly and it left only a scant amount of lacing behind. A fine ring was left around the top though. The nose presented…. well…. cherries, cherries and more cherries. It smelled like a combination of cherry juice and cherry lifesavors. Only a slight hint of sourness was detected. I’ll tell ya. That’s about all I could pick out. I’m sure there is something else involved, but I don’t have a clue as to what it might be. Just sweet cherries is all I know. The taste brought on additional heavy doses of sweet cherries. Oh, and have I mentioned it tasted like cherries???? I might be picking up a minute hint of Belgian yeast in there as well as a small touch of alcohol. I wish I could say more, but I can’t get past the cherry savors. It kind of tasted like a “mixed” drink. I will say that as the brew warmed a bit, it did become slightly more tame, earthy and bearable, which I’m guessing is from the yeast. Who knows? The mouthfeel was medium bodied. Mostly smooth, crisp and dry. A very small amount of warmth was felt as I swallowed and I found that not nearly as much flavor was left behind as I thought might be with such a forthcoming flavor. Well. This beer is very much one dimensional. It’s a little too sweet and too “cherrified” for me. A tad hard to drink. Hmm. I’m not real sure about it, but I doubt that I will be picking this up again anytime soon. It didn’t have quite enough sourness or “funk” to be classified as a Lambic and the unreserved sweetness showed no remorse. Hey, if you favor the heavy fruit and vegetable beers, this beer might be right up your alley. Don’t take my word for it. Try it for yourself and see what you think. Do you guys like fruit/vegetable beers??? If so, which one’s do you prefer??? Be sure to leave a comment and let me know. Thanks for reading and commenting guys. Until next time.